This is my best value diaper cake for the mother-to-be. Also makes a great starter package for Grandma! The stork bundle has a soft, handmade flannel blanket 35" x 41" with folded hem edge to ensure years of use. It also includes 16 Size 2 diapers (14 - 18 lbs. with a wetness indicator), a BPA free bottle, a BPA free rattle or teether and a package of baby wipes. It stands 10-3/4 inches high and is 10 inches wide at the bottom. Everything is new but taken out of original packaging. 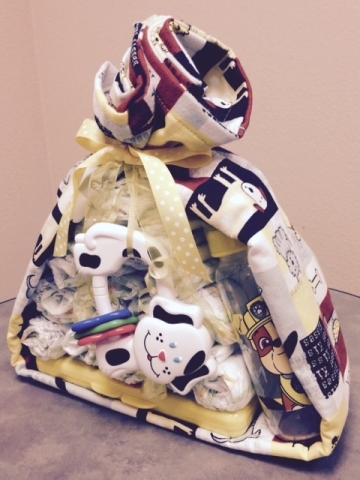 Great to give as a centerpiece, shower or new baby gift. Patterns of materials will vary due to availability. Selection is Designer's Choice. Customization is an additional charge. Shipping is $30 and up (depending on the zip code where it is being mailed to, weight and mailing box size) not the $7.50 shown in the cart. This is also available for local pickup in Phoenix, Arizona. Pretty and practical!